Dublin City Council (via the Smart Docklands Programme) have brought together a consortium of amazing partners – Grangegorman Development Agency, the Open Data Unit (DPER), The Department of Community and Rural Development, Science Foundation Ireland (SFI) funded Building City Dashboards Team at the University of Maynooth and D3D – to create the first 3D Data Hackathon in Ireland. This Hackathon aims to engage anyone with an interest in 3D data and the built environment, from those working with BIM (Building Information Management) to App and Game Developers, Urban Planners and more! The event is hosted by Autodesk ® and Hibernia Reit. Other supporters of the event include Google, Leica, ESRI, Invicara and Bim & Scan, with more to be announced. We are also delighted to be officially partnering with the AR/VR Innovate Conference –which takes place on Friday 10th May, 2019 in the RDS, Dublin. Participants will get exclusive access to the 3D model as well as more detailed building models. Given the complex nature of the data available, we will be providing access two weeks in advance of the Hackathon to all fully registered teams. Registration: You can register your interest here as an inter-disciplinary team with up to 6 team members, or as an individual and we will place you in a team before the Hack starts. Places however are limited, so please register early to avoid disappointment. 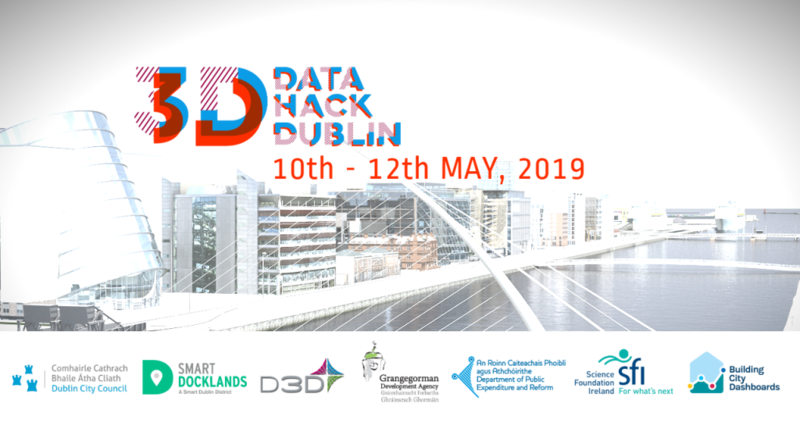 More details on the challenges for the Hack and relevant data sets will be provided to teams who register before the deadline of noon on Friday 26th April, 2019. Prizes will be awarded to the overall winner and runners-up. Winning teams will be scored on the novelty of their idea, alignment with the challenge areas, viability/impact and commercial/social impact. Prizes will include funding and other supports for developing your solution, mentoring, and access to workspace and exhibition spaces as well as media coverage of your idea. The winner and all runners-up will be invited to participate in an exhibition of their work as part of a ‘Future City’ AR/VR showcase in the CHQ building in the Docklands in late September 2019. The main data sources for the event will be an extract of our 3D Docklands model, as well as a number of data-rich models of specific buildings in IFC format. The Docklands model data will be provided in FBX and 3D Studio Max format, which can be used in free and Open Source modelling software such as Blender, but also with popular free and low-cost game engines such as Unity or Unreal Engine 4.There will also be a number of data-rich building models to play with, suitable for use in BIM surfer, BIM server, IfcOpenShell, IfcPlusPlus, FreeCAD, xBIM Toolkit or any other openBIM system. Participants are strongly encouraged to utilise additional open data from Ireland’s national repository Data.gov.ie, and Dublin’s own local open data repository Dublinked.ie We will be providing a ‘curated’ list of open data sets from the Dublinked portal to registered participants. You are also welcome to use any other relevant open data you wish.